If you run an internal link audit to refine and improve your marketing strategy, you would get to know what is missing and what you have to update about your website. You need to understand the fact that just running a huge content marketing initiative without a well-planned internal link strategy, you just restrain the spread of link authority through the entire website. You should audit your own internal link structure to ensure that you’re not keeping a blog post from being crawled on or from obtaining ‘link juice’. Content which is not interlinked in a proper manner might not live up to the entire ranking potential and it won’t even be found by users. Now that you know this, you must be reviewing few best practices that you should follow with regards to interlinking as it is still the key to SEO development. Besides the optimization value of internal links, it is also important for the user experience. If there is a user-friendly structure of interlinks which have a drop-down menu and also a navigation bar with links directing to content, this can satisfy the intention of the user and can make your site SEO friendly as well. For more website interaction, you should offer clear labels for every link that you have. The longer the user remains on your website, the more chances you have for a conversion. 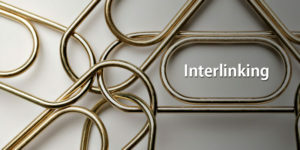 Internal links, much unlike the other form of links called the backlinks, have no such impact on the algorithm of Google. However they increase the flow of backlink authority which spreads from one page to the other. The new articles written for blogs are written with no recognition or authority. With a link from either the cornerstone or the home page, you can immediately transfer the authority that you earned before to the new web page. This post will definitely be indexed sooner and the resulting rank will also be higher. Site architecture: The internal link structure should form a pyramid where the home page will lie at the top, beneath that lies the category pages or cornerstone pages which link deeply to the relevant posts and product pages. Content links: Content is not only the simplest place to insert links but they even help improve a site’s user-experience. When you bold content links, they stand out from the rest of the crowd. Relevancy of links: Relevancy is the main component of internal linking and link building. Optimize the anchor text to reflect the topic of the landing page to which it is being linked. If you place an anchor that’s irrelevant, this will make your website spam-worthy. When search engine optimizers think of building links, they usually ignore the SEO value and user experience. Backlinks might remain the crown of SEO but their impact can only be increased with a sophisticated internal link which spreads the information through the site.